Hi musicians. 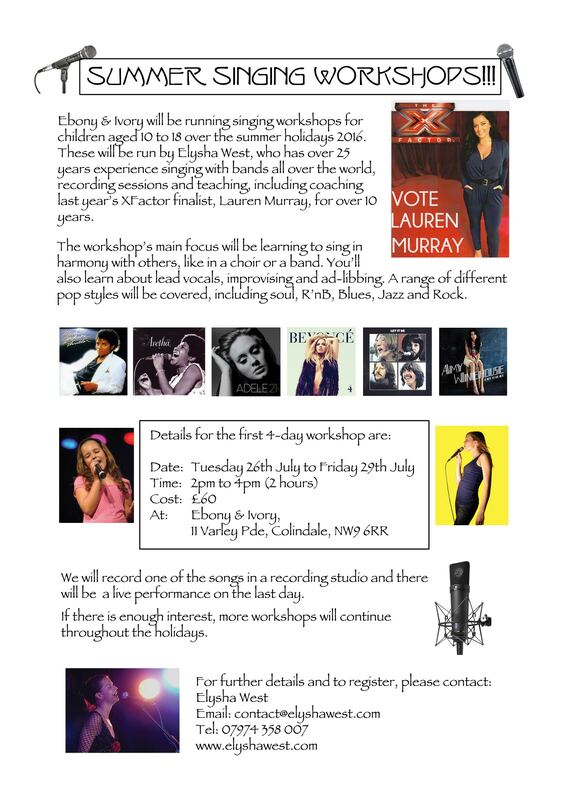 Our amazing singing teacher, Elysha West is going to be running a singing workshop at the end of July. The workshop will focus on the joy of group singing and harmonising as you would in a choir or a band. The workshop will also teach you about improvising/ad-libbing and singing lead. A range of different styles will be covered including pop, R’nB and blues. The singers will be recorded in a professional recording studio and there will be a performance on the last day. The singing workshop will take place at Ebony & Ivory music school over four days from Tuesday the 26th of July to Friday the 29th of July from 2pm to 4pm each day. The cost is £60. To register or for more information, contact Elysha on 07974 358 007 or contact@elyshawest.com. band, choir, jazz, music, pop, RnB, rock, singing. Bookmark.